In my continuing search for whole wheat breads to add to my list of favorites, today I baked the “Sourdough Whole Wheat Bread” from Michel Suas' “Advanced Bread and Pastry.” I had previously baked the Honey Whole Wheat from AB&P, but still prefer Peter Reinhart's 100% Whole Wheat from BBA to it. Most of my bread baking is with sourdoughs, and I want to have a sourdough whole wheat bread that I really enjoy in my repertoire. The one I have made - I can't remember where I got the formula - was not to my taste. I just didn't like the combination of sourdough tang and whole wheat flavor. On the other hand, I have enjoyed other sourdough breads with a high percentage of whole grains, so the AB&P formula seemed worth trying. Yes. I know it's not “pure” sourdough, and it's not close to purely whole wheat, but if Chef Suas wants to call it “Sourdough Whole Wheat,” who am I to quibble? Mix levain ingredients and ferment at room temperature for 12 hours. Mix all ingredients to medium gluten development. The dough should be quite tacky. Divide into 2 equal pieces and preshape for boules or bâtards. Let the pieces rest, covered, for 20-30 minutes. Proof en couche or in bannetons for 60 to 90 minutes. Bake at 450ºF for 35 minutes with steam for the first 12-15 minutes. I mixed the dough in a KitchenAid stand mixer for 3 minutes on Speed 1 and about 7 minutes on Speed 2. After bulk fermentation, the dough was still tacky but very extensible. I rested the loaves seam side down after pre-shaping. This was a mistake. There was enough flour on the seam side to interfere slightly with final shaping. (See my boule tutorial.) I recommend proofing seam side up. I think I slightly over-proofed (90 minutes) and got less oven spring than I thought I should get with this bread. The crumb was quite chewy. The flavor was rather simple – A very slight sourdough tang and a straight ahead whole wheat flavor with no grassiness or bitterness. I look forward to tasting the bread as toast in the morning and as a sandwich for lunch tomorrow. They have a wonderful golden and brown hue to the crust, though not as dark as your usual bakes. Possibly as a reult of the slight over proofing I suspect. I'm guessing your experiences so far with "whole wheat" bread have roughly paralleled my own: decent to better than decent loaves as far as crust and crumb will take you, and ho-hum for flavor. My own reactions have been thus, and as of yet I cannot find a whole wheat (or even "mostly" whole wheat) recipe that is not one or more of: too strongly sour, too stronlgy "whole" wheat (grassy, bitter or both) or just not remarkable. For what you call over-proofed though you got very nice crumb. Not as open as your usual results, perhaps, but certainly not the dense bricks I associate with my own (frequently) overproofed results. Thanks for sharing, and I'll continue to watch for you to find "that formula" for a whole wheat bread favorite. The lighter crust color can be attributed to the lower oven temperature, I think. The degree of over-proofing, if any, was slight. I was happy with the crumb, for a bread with this amount of WW. I have been using an oval banneton. On a baker/friend's advice I have been flouring it with a mixture of 50/50 rice flour/rye flour. This mixture releases the loaf well, but I always get rather faint flour markings on my loaf. 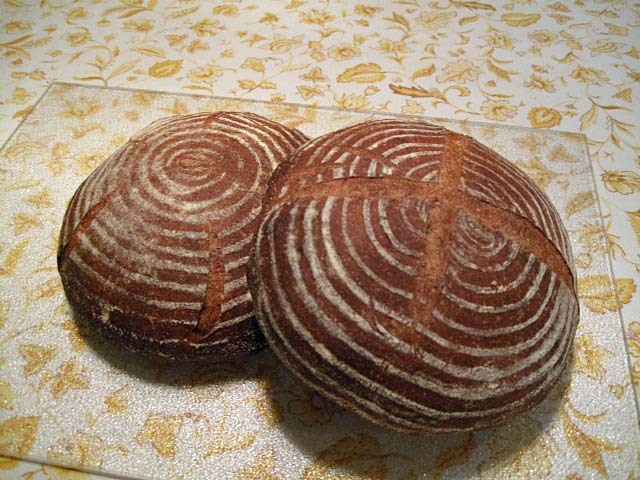 How do you prepare your banneton to get the nice circular pattern on your boules? I also use 50/50 AP/Rice flour. I almost always get nice flour lines. I don't know of an special tricks. Lovely Bake, David! Maybe overproofed, but wonderfully baked. and thanks for posting the recipe, we all appreciate it. David, i noticed that you did not fold the dough, or have you? I guess a firm levain will impart enough acidity to the dough, that folding will bring about too much tightening. Right? Suas doesn't call for fold. I did pre-shape and shape tightly. I may have over-done it slightly, in fact. Can't speak to the impact of the firm starter. It's a thought. Greg, i think you may need to watch for the type of rice flour you use. It has to be non-glutenous Rice flour. I've also tried this formula a few times, and it makes for pretty decent loaves flavourwise. 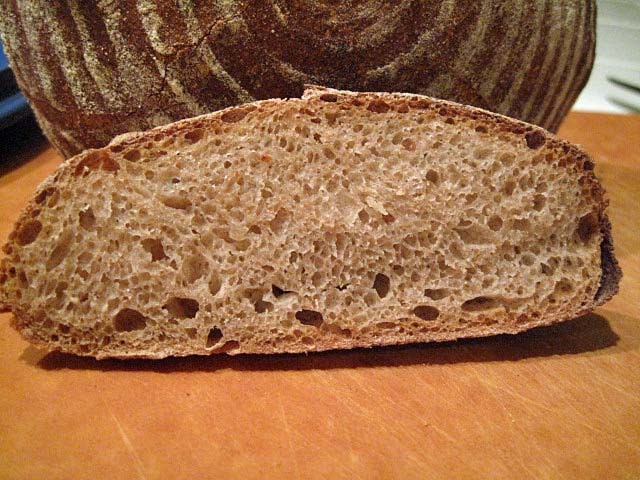 Have you ever tried Hamelman's whole-wheat levain in your quest for the perfect WW SD? The formulation is pretty similar to Suas, but the preferment is different and there's no baker's yeast in Hamelman's formula. I guess you could remove fresh yeast from Suas' formula as well by lengthening the proof. 2 - 3 hours, or retarding overnight could be worth a shot? In the meantime, enjoy the loaves! I have made a SD WW with no added yeast. It may have been Hamelman's. I couldn't find my report on it yesterday. Whatever it was, I didn't like how sour it was. WW seems to offer the acid-producing bacteria a lot to work with. There have been a couple of batches that were just too sour for my tastes. And yet, it isn't an every time occurrence. I'm not sure what to make of it. The crumb is gorgeous and I'm sure it's a very delicious bread. The 100% White Whole Wheat, Steve has it posted at breadcetera, I have baked it is delicious...I wonder how it would be converted to a SDWWW. Do you think the more WW is used the more sour WW bread would taste? 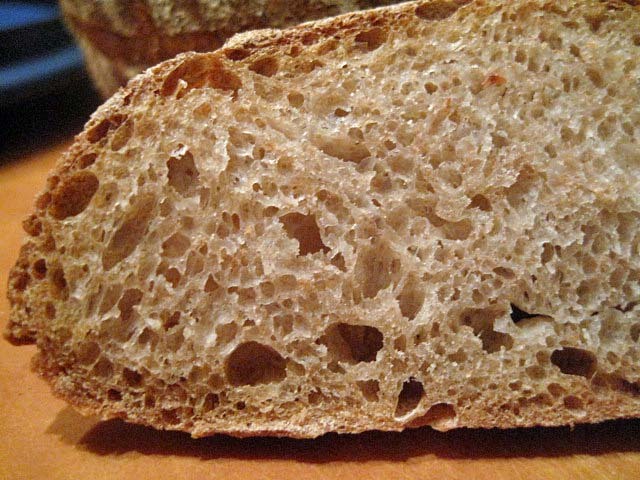 ADDED: White Whole Wheat has a milder taste...WW was refering to the WWW. I also wondered why they called it a WW bread when it included White flours..when a bread is stated as being a WW bread it doesn't mean what flours are used in the bread, it is referring to the wheat only as being a 'whole grain' used...I just read this again a couple of days ago googling. Among whole wheat breads, I find I still prefer a 100% WW - "Honey WW" style bread. Making something like this with WWW has been on my "to bake list" for quite a while, but it's never floated to the top. We made a WW bread at the SFBI that is not in AB&P that I prefer to this one. It uses a yeasted pre-ferment that is cold-retarded overnight after 1 hour of fermentation. I may convert that to sourdough and give it a try. I think this looks a really good formula for working with wholewheat flour and producing these lovely boules. I've always equated wholemeal bread to just that; ie. 100% wholewheat. Maybe that's because there is strict legislation in the UK about the use of the terms wholewheat and wholemeal regarding flour? I guess I've just extended that to the finished bread. But baking loaves at 50:50 and calling them wholewheat seems commonplace, so I must be out of step here. A colleague and professional baker in Northumberland has a similar loaf to this called wholewheat, and Hamelman's formulae all have similar proportions. It's strange, but I don't particularly like breads that have about 50% whole wheat, unless they are basically multi-grain breads with lots of other good stuff. Reinhart's 100% WW from BBA is a favorite. It is Honey WW-style and uses a soaker. I have always included a bulghar soaker, which adds a nutty flavor and chewiness. Perhaps I should just stick with a winner, but I can't help wanting to broaden the repertoire. Terminolgy can be misleading, even ingredient lists (at least here). Perhaps a wry flower would add a nice touch. You talkin' about my friend, Daisy? What a great forum where we can pick at your rather perfect loaves. I'm not an expert in WW but there are a few things I have learned that might be helpful. I never made a loaf of WW bread in any percentage that I liked until I tried flourgirl51 fresh ground WW. I'm sure it has as much to do with the grain she is milling, which is Organic. That flour delivers a superb aroma and very nice whole grain flavor. The same is true for her Rye products. The grassy flavor or bitter after taste is non existent in her fresh ground flours. For me it starts with the flour selection. Secondly, I have been experimenting with sweeteners. The flavor profile range in honey alone is remarkable. Clover honey, buckwheat, peach etc depending on the flower being pollinated all have a distinctive flavor. Sorghum is a dark sultry sweetener that brings a distinctive taste. Molasses or black strap is near sorghum without the deep after taste. You probably know of Agave. While it is a great sweetener, I don't care for the effect in bread. The above I have experimented with and enjoy each for it's unique effect on the final bread. I agree with you on a honey WW being a great bread. The range of outcomes achieved by swapping the sweetener makes it hard to compare apples and apples. If you asked me for a suggestion, I would say find some buckwheat honey and try that with Rhonda's WW. I have quite a stock of WW flour at the moment, but I appreciate your recommendations.